In the opening foreward of Chris Jericho’s new book “Undisputed : How To Become The World Champion In 1,372 Easy Steps” Mick Foley writes about how back in 2007 when Jericho’s first autobiography “A Lion’s Tale” was released, Foley found himself not only enthralled in the story Jericho was telling but worried that he was about to lose his title as the wrestling star with the best autobiography out there. While Foley has never defeated Jericho in a wrestling ring (a point Jericho makes sure to point out numerous times throughout this book) Mick refuses to relinquish his title in the author’s squared circle but not before putting him over big time and basically admitting that if someone is the next Mick Foley in the wrestling author ranks, its Chris Jericho. If anything that is all you need to know before deciding whether or not to pick up Jericho’s new autobiography as Jericho delivers another awesome read. Picking up where A Lion’s Tale left off, Y2J takes you through his WWE career to date beginning with the infamous debut segment on Raw where he interrupted The Rock turning out to be one of the most unique debuts in recent memory. Despite this fact, Jericho’s early days in the WWE were no different than many before him as he recalls the massive heat he developed backstage as he tried to adjust to the WWE way of doing things. Jericho’s story is both intriguing and hilarious at the same time. Coming from WCW to the WWE was a major transition for Chris. In the first few weeks and months of his WWE career he managed to piss off locker room leaders like The Undertaker and Triple H, developed a reputation of being green as grass and nearly had his “Walls of Jericho” finisher named “The Salad Shooter” of all things. Yes that’s right, WWE’s creative team offered up some of the dumbest names one can think of, and Jericho includes the original email to prove it. Reading the stories of Jericho’s interactions with boss Vince McMahon is a fascinating look inside the WWE that we rarely get. Any wrestling fan has heard the things the so called dirt sheets has had to say about McMahon and his rapport with his staff, but having it come straight from the mouth of someone who has spent a lot of time working for him and someone without an agenda of being bitter over a release or sucking up in hopes of a push, makes much of this book a truly awesome read. Coming in at nearly 450 pages the book covers a lot but doesn’t seem anywhere near that long as its quite the pager turner. Amongst what will be the most talked about chapters is the one simply entitled Benoit. It may be nearing 4 years since the tragic events of June 2007 but reading this chapter about Jericho’s interactions with Benoit in the weeks leading up to the tragedy and his reaction is truly captivating. Although Jericho doesn’t intend to offer up any sort of new information on the tragedy he indirectly does so when describing how hard it was for him to interact with Benoit during his final years due to Benoit’s anti social nature. Much like he did during the few media appearances Jericho made during the media blitz that covered the tragedy, Jericho does what I consider the best job in telling the world how and what to separate when thinking of Chris Benoit the man versus Chris Benoit the murderer. The other important aspect of this book is Jericho’s decision to chase yet another dream with the formation of his band Fozzy. The chapters about the adventures of Fozzy are sprinkled throughout the book and are just as interesting as the wrestling related chapters as you learn a lot about how the recording industry truly works and how hard it was for Fozzy to even get to the point they are today. 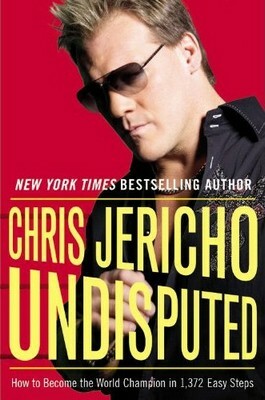 Overall, Undisputed is yet another great book from Chris Jericho. It’s honest, its entertaining and it’s insightful, I highly recommend it , and to Mick Foley I’d say watch out, Jericho could quickly become the “undisputed” wrestling author champion of the world. Chris Jericho’s “Undisputed : How To Become The World Champion in 1,372 Easy Steps” will be available February 16th in book stores everywhere. You are currently browsing the archives for the Chris Jericho category.